Hansford Parts and Products manufactures and stocks standard English and Metric sizes of cutters and bushings for use on all Davis Keyseaters. They are designed and manufactured to exacting specifications to obtain the highest efficiency from Davis Keyseater Machines. Radius cutters, angle cutters, and cutters made to sizes and/or lengths other than standard, as well as special size bushings are available upon request. 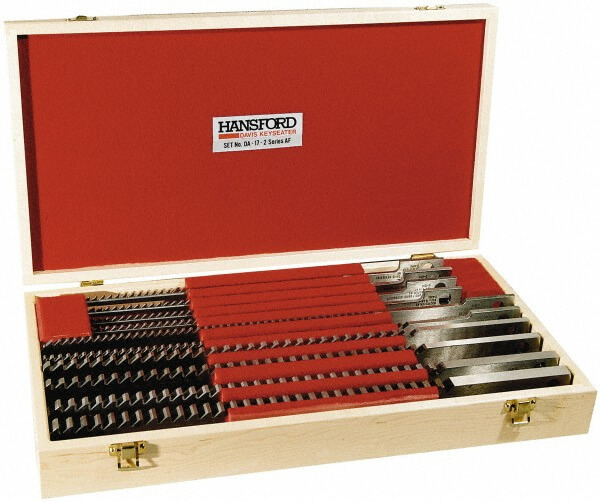 Hansford Parts and Products also provides re-sharpening services. Standard sizes available from our stock are listed on following pages. In addition to individual cutter sizes from 1/16″ to 1-1/2″, we offer cutter sets in the AF and AFS series. The DA17 sets cover the keyway size range from 1/16″ to 3/4″, and the DA-18 sets cover the range from 7/8″to 1-1/2″. Cutter sets are recommended for applications where the size of keyways to be cut cannot be predetermined upon purchase of a Davis Keyseater machine. Metric size cutters are also offered in sets. Series AF Cutters are designed with side clearance, a 10° rake angle, and a relief angle for the higher speeds and feeds demanded by automatic cutting. They are accurately hardened and ground to provide optimum cutting efficiency and better finishes. Series AFS Cutters are AF type cutters with a staggered tooth configuration. They cut more efficiently and do not load with chips when cutting keyways over 5″ long which are 1/2″ in size or larger. In many cases, they eliminate the need to take a pilot cut. Series AF and AFS Cutters are available to meet your needs for keyways that are not standard, such as radius cutters, angle cutters, as well as cutters made to your size and/or length requirements. Send us your part drawing or specifications for a quote and prompt delivery. In addition to individual bushings and bushing holders, Bushing Sets are available to complement the cutter sets offered. Bushing Set DA-82 is illustrated in the photo, and it is intended for use with a DA-17 cutter set. 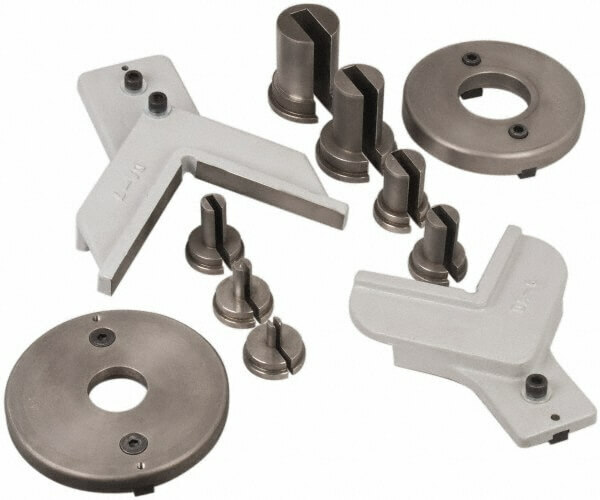 Bushing sets include work locating bushings that match each cutter in a cutter set, the necessary bushing holders for clamping the bushings included in the set to the keyseater table, and work centering vee blocks to accommodate more than one bore size with the same diameter bushing. Bushing Sets are available in both English and Metric sizes. This quick-acting workpiece-locking device quickly locks work materials in exact position and holds them rigidly in place. You can mount it in position on a machine tool bed, work bench, table, etc., and tighten it down by using the flats wrench-application located on the top of the height column. This machine tool prevents fumbling, is completely adjustable to different heights, and uses normal hand pressure for positive locking action. Kwik-Klamp eliminates complicated, hard-to-adjust makeshift holding arrangements as well as conventional methods, including studs, t-nuts, step blocks, shim stacks, and setup clamps. Simply adjust the pressure foot to the desired height, place the workpiece in position under the pressure foot, and move the cam handle back to apply the required force (light, medium, or heavy) on the workpiece. Positive locking action is created by wedging action on the height column when the cam handle is operated. The accessories shown will allow you to arrange your Davis Keyseater to suit your internal keywaying and/or external slotting requirements. Source of illumination directly at the work. Accessory No. DA-62 for all models. Where the O.D. of the work-piece is greater than can be accommodated by the standard throat depth of 19″ on the Model 15, a 3″ Extra Throat Depth Assembly is available as an option, and the increased diameter that can be accommodated is consequently 6″. Accessory No. DA-60 for Model 15. Where the workpiece is higher than can be accommodated by the standard vertical capacity of 12″ on the Model 15, an additional 6″ can be accommodated by this longer arm-post, Accessory No. D-1701 for Model 15. For use on Model 15 machine only, Accessory No. DA-58. This accessory is necessary to enable the Model 15 to cut a keyway that must be parallel to a tapered bore or to cut a tapered keyway in a straight bore. Tapers up to 4″ per foot (included) may be accommodated. Due to the height of the tilting table, the length of cut capacity of a cutter is reduced by 2 1/2″. Available for the Model 15 only as Accessory No. DA-86. It mounts to the resistance arm and is used to guide a cutter for external slotting of parts. A micrometer depth stop is standard equipment on Model 15 machines. The micrometer has a floating zero which is set at the point of contact between the cutter and the workpiece, and then turned counterclockwise for the desired depth of cut. A micrometer depth stop calibrated in metrics is also available for all models of the Davis Keyseater. The DAVIS Index Table (Accessory No. DA-22) can be used on all models of Davis Keyseaters and provides an accurate means of indexing work-pieces for cutting internal multiple keyways, standard splines, or multiple grooves. It uses special centering bushings and centering rings and they must be ordered separately to suit individual requirements. Due to the height of the Index Table, the length of cut capacity of a cutter is reduced by 2-1/2″. This accessory is used to provide back. up support of tall work-pieces and can be used on all models of the Davis Keyseater; Accessory No. DA-9. Available on the Model 15 only as Accessory No. DA-27. It is standard on the DA-15B; optional on the DA-15A. Provides an infinitely variable speed range of 11 to 56 strokes per minute to achieve the proper surface speed and cutting efficiency for a variety of materials. It allows the operator to slow down the machine speed when cutting hard materials such as stainless, and to speed up the machine speed when cutting soft materials such as aluminum and cast iron. The result in all materials is a reduction of the cutting time, and an increase in cutter life between sharpenings. Constant power is developed throughout the speed range and speed can be changed under full load.